A small statue within a larger Buddha statue. Even in our modern times, you can buy a small statue and insert a sutra with the name and dates of a loved one passed away. The statue will then be placed in the mortuary of the temple Ushku Daibutsu. There priests will say prayers in the morning and evening of each day. At the temple housing Nozaki Kannon in Osaka, you can make a financial donation to support the temple and get a small Kannon Statue, which will be placed inside a larger one of any of the 16 famous Arhat statues. 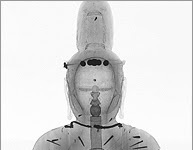 After an X-ray examination a small five-tired pagoda was visible inside the statue. 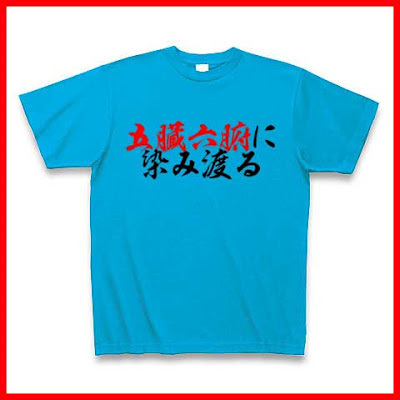 Also nounyuuhin 納入品, tainai nounyuuhin 胎内納入品, tainai nounyuubutsu 胎内納入物. Objects found in the inner hollow of a Buddhist statue. There are a great variety of zounai nounyuuhin, and items including written documentation have been especially useful to scholars investigating the origin and history of Buddhist figures. 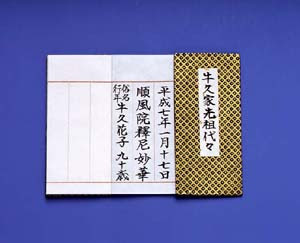 copies of sutras; and Buddhist prints, inbutsu 印仏 and suribotoke 摺仏. 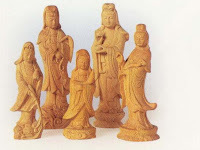 Wooden items include plaques bearing the sculptor's signature, date, and other information about construction; miniature stupas, gorintou 五輪塔; and small Buddhist figures, tainaibutsu 胎内仏. 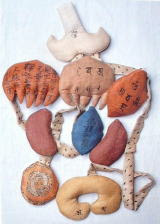 There are also reliquaries made of crystal, precious metals, stone or lacquer, containing bones of the Buddha, shari 舎利. Other zounai nounyuuhin include glass vessels, coins, jewels, mirrors, fabrics, grain, medicine, and household items. Sutras and relics inside a figure are believed to give the statue its soul, investing it with the spirit of a living being, a concept known as shoujin shisou 生身思想. Early Japanese examples are the Yakushi Nyoraizou 薬師如来像in Toushoudaiji Kondou 唐招堤寺金堂 (Nara), which has coins enclosed in the skirts of the statue, and Senju Kannonzou 千手観音像 in Touji Jikidou 東寺食堂 (Kyoto), where relics are contained in the byakugou 白毫 (forehead curl), and cypress fans (hiougi 桧扇) in carved out hollows under the arms. 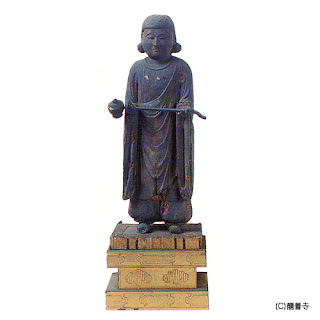 In wooden statuary, hollowing techniques, uchiruri 内刳, and building figures from hollow joined blocks, yoseki-zukuri 寄木造,　developed during the Heian period (9-12c), making large spaces in the bellies of the statue available for zounai-nounyuuhin. This culminated in the Kamakura period (13c), when the quantity and variety of examples are greatest. 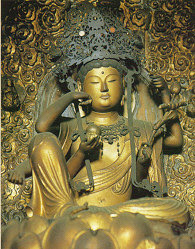 Inside the statue of Nyoirin Kannon was a small statue of Kannon made from gold. the six hollow organs (stomach, small intestine, large intestine, gall bladder, urinary bladder and reproductive organs). this spreads around nicely in my inner organs. Here is the famous statue of Shaka Nyorai, which was introduced from China in 987. Inside are small paintings and other items. One of the most spectacular are the "inner organs" gozou roppu. They even include a small umbilical cord. 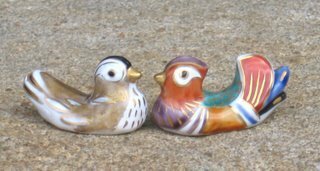 They were made from silk material. Now, they are a national treasure of Japan. Shakado 釈迦堂 The Shaka Hall . 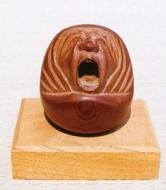 A little Daruma talisman, containing a small seated statue of Kobo Daishi. This is a modern version of the "inside" concept. Temple Nr. 82, Negoro-ji, is located in the middle of a dense forest on a high mountain. There again I found a little red talisman of Daruma with a hole in the back, but this time a little frog was peeking out of it. Im Inneren einer großen Statue wurden auch kleine Statuen (Buddhas im Leibesinneren, tainai butsu, tainaibutsu) oder Sutras verborgen.
. Kaneko Tohta, Kaneko Tota 金子兜太 .
. Voices of Animals . This is truly fascinating information.